Sanders said his program would save $2 trillion over 10 years. Sen. Bernie Sanders took aim at a new report released by a conservative Koch-affiliated economic policy think tank, saying its findings “accidentally make the case” for Medicare-for-All. “Let me thank the Koch brothers, of all people, for sponsoring a study that shows that Medicare-for-All would save the American people $2 trillion over a 10-year period,” Sanders said Monday in a video released on Twitter. The report was published Monday by the Mercatus Center, a think tank at George Mason University that receives donations from the conservative Koch network and supports "market-oriented ideas." 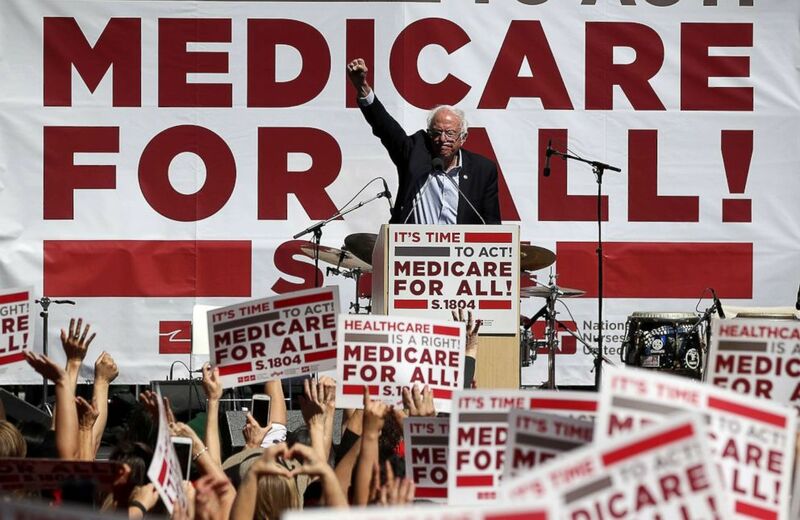 It concludes the Sanders Medicare-for-All plan would increase federal budget commitments by about $32 trillion over its first 10 years of implementation. Medicare-for-All, also known as single-payer healthcare, has become increasingly popular among Democrats, including progressive candidates such as Alexandria Ocasio-Cortez, who pulled off a shocking primary upset last month in New York’s 14th Congressional District and made the issue a central part of her platform. ?? My platform brings all the votes to the yard: ?? “I suspect that that is not what the Koch brothers intended to do, but that is what is in the study,” Sanders said of the projected savings. (Washington Post/Getty Images, FILE) Charles Koch talks during an interview with the Washington Post at the Freedom Partners Summit on Monday, Aug. 3, 2015 in Dana Point, Calif. While the Koch brothers themselves did not author the report, Koch Industries CEO Charles Koch sits on the board of the Mercatus Center. 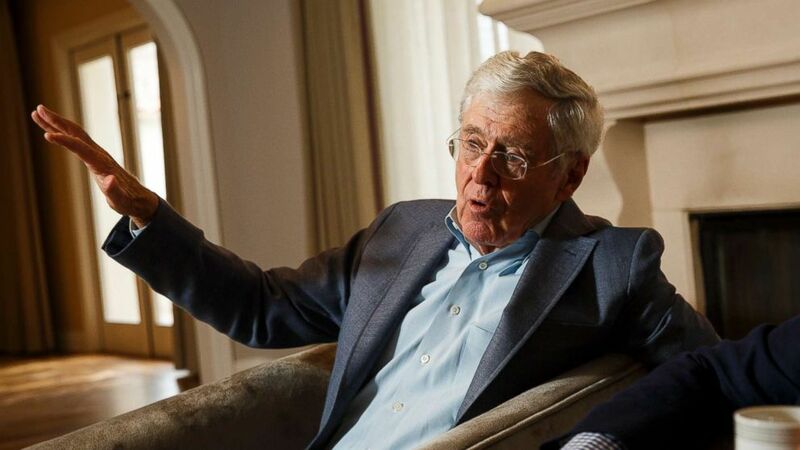 This past weekend, the Koch network held its biannual meeting in Colorado Springs, where it said it plans to rebrand itself ahead of the midterms. Robert Graboyes, a senior research fellow and health care scholar at the center who read Blahous’s report through its production, said the report doesn’t “predict” $2 trillion in savings. “The paper says if Sanders’s plan fulfills everything its supporters hope it will fulfill, it will result in $2 trillion less in expenditures,” he told ABC News. And more important, the $32 trillion dollar figure isn’t new, according to Graboyes, who says even left-leaning think tanks have come to similar conclusions. “The Urban Institute, which is left-of-center, also found that the Sanders plan would cost $32 trillion,” he said, referring to the group's 2016 report concluding then-presidential-candidate Sanders’s plan would have increased federal expenditures by $32 trillion between 2017 and 2026. (Justin Sullivan/Getty Image, FILE) Sen. Bernie Sanders speaks during a health care rally on Sept. 22, 2017 in San Francisco. But Graboyes warned that, according to the report, even doubling all currently projected federal individual and corporate income tax collections would be “insufficient” to finance the costs of Medicare-for-All. “In individual states like California and Vermont, similar single-payer healthcare plans tanked because increasing taxes was too much of a gamble,” he said. 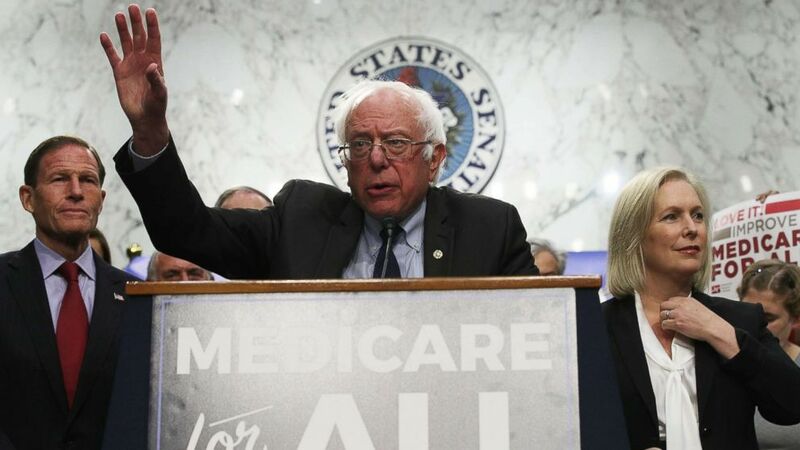 Josh Miller-Lewis, Sanders’s press secretary, said the additional $32 trillion is already being spent by private insurers, and the Medicare-for-All plan would simply move the money to the government. “In the process of moving the money from private insurers to a national health care system, you’re actually saving $2 trillion by making the system more efficient,” he told ABC News. (Alex Wong/Getty Images, FILE) Sen. Bernie Sanders speaks on health during an event on Capitol Hill, Sept. 13, 2017 in Washington. Moreover, the fact that a conservative institute drew conclusions about the plan’s savings is a testament to the Medicare-for-All’s efficiency, according to Miller-Lewis. “This is a right-wing think tank, and even they found that Medicare-for-All would save money compared to the current system,” he said.